Riley has a very rare disease that only 1 in 50,000 to 100,000 people are afflicted with in the world. Riley has what is called Methylmalonic Acidemia Mut 0. What this means is that she does not have the ability to break down the proteins in food to the essential amino acids needed for normal growth. Instead, her body creates high levels of ammonia and acid, both of which are directly toxic to the brain and organs. To give you some insight on how severe her condition is, when Riley was admitted to the NICU at birth her ammonia levels were as high as 870 ppm. The normal range for a newborn is 30-50 ppm. Baby Riley was born June 3, 2010 at 2:34 in the afternoon and weighed 6 pounds 11 ounces. She appeared perfectly healthy and was the most beautiful baby we had ever seen. We were sent home June 5th as two incredibly proud first time parents. The next day, Riley went to her grandma’s. That evening, I came over to watch the Laker game and noticed that her breathing was a bit labored and heard she hadn't eat well the entire day. We decided to take her to a hospital in Pasadena as something didn't feel quite right. When Riley arrived, the neonatologist immediately said that she was very sick. They ran a few tests and before we knew it she was rushed to Cedars Sinai Hospital in Los Angeles. That night was the worst night Katie and I hope to have for the rest of our lives. We arrived at Cedars around 12:30 AM and immediately spoke with one of the resident pediatricians in the neonatal high intensive care unit (NICU). She was supportive, though brutally honest. She said the next 48 hours would be the worst of our lives and that we would be bombarded with a team of specialists all trying to save our daughters life. We saw 3 kidney specialists including a dialysis doctor, a neonatologist, 2 geneticists, 2 pediatricians and countless nurses. If it weren't for the neonatologist from the Pasadena hospital and the dialysis specialist, Riley would not be alive today. Katie and I are forever grateful for them. We watched as countless doctors huddled around our baby girl trying to save her life. After two rounds of dialysis treatments and countless Kleenex boxes later, she began to get better and we returned home from the hospital after 11 long days. After we were released from the hospital, Riley, Katie, and I all settled in and got to know one another. For the first couple of months, aside from her specialized diet, Riley was just like any other baby. She slept quite a bit, loved her mom, and had a spark about her as though nothing could bring her down. It was in this spirit that Katie and I decided to take Riley on her first vacation in August of 2010. We were a bit nervous as we had been monitoring her so closely and we didn't want to be too far away from Cedars Sinai Hospital as we knew not every hospital could handle her disorder. Nonetheless, in an effort to give Riley as normal a life as possible, we decided to go. Looking back, I'm not sure I'd make the same decision again but no use in complaining about it now. Riley didn't do too well on her first trip away from home for whatever reason; we still don't know. Her ketones were elevated and she was throwing up constantly. Ketones are substances that are made when the body breaks down protein for energy. Normally, your body gets the energy it needs from carbohydrates in your diet. Riley's ketone levels are one of the things we monitor constantly. Despite these setbacks however, we stayed in touch with our doctors and were able to maintain her levels at home through the use of her 'sick day diet'. This all changed in October when we had our first trip back to the hospital after being released 4 months earlier. 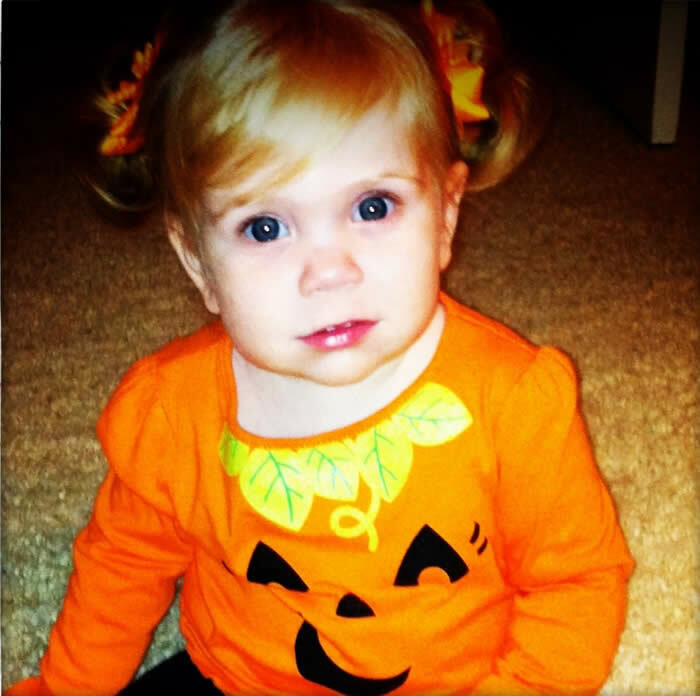 It was October 31, 2010, when Riley experienced her first metabolic episode. For the past few months, Riley was eating surprisingly well according to her doctors and wasn't having nearly as many 'episodes' as other cases they were familiar with. On Halloween night 2010 however, that all changed. Riley was refusing to eat, vomiting, her ketones were the highest we had seen them, and she seemed weak and lethargic. Without really questioning anything, Katie and I both decided that we needed to rush her to the hospital. Unfortunately though, as mentioned earlier, we couldn't just go to any hospital. We had to travel for an hour and fifteen minutes to Cedars Sinai in Los Angeles. Needless to say, that was a terrifying car ride for Katie and I, but more importantly Riley. Our first hospital visit back was more terrifying still. When Riley gets sick, it's important that she is hooked up to IV's as soon as possible so that she can get the medicine and hydration in order to prevent her body from going into a deeper metabolic crisis. When we got to the ER, the nurse attempted to start an IV in Riley's wrist and was unsuccessful. After three more failed attempts, she called someone else in to try. This went on for 6 hours. All the while, Riley was screaming bloody murder looking at her mom and dad wondering why they are putting her through this terrible pain. It was heart wrenching. After 4 sleepless days in the hospital, countless needle pricks for Riley, we all got to go home. The Halloween night visit to the hospital was the first of many in the months to come. Two weeks after this visit, we were admitted again for five days and then again two weeks after that for three. It was on the third visit to the hospital that Katie and I made our first difficult decision in regards to the treatment of our daughter. After having Riley suffer through countless hours of needle pricks and being held down by complete strangers, we decided to move forward with a portacath surgery for our daughter. This would eliminate ever needing to draw blood from her veins again. A portacath is a small medical device that is inserted directly underneath the skin, typically near the clavicle, which has a catheter that extends near the heart. It is easily accessible and allows for the drawing of blood and insertion of medicine. Because of the frequency of our hospital visits and the agony Riley would go through while being held down, we felt we had no other choice than to go through with this surgery. In addition to the portacath surgery, she also had a g-tube inserted. This allows us to feed Riley the formula she needs when she refuses it by mouth. By having this, we have since been able to avoid a few hospital visits as we are able to administer the medication and/or formula she needs at home through the use of a feeding pump. The two procedures were completed in about 2 hours and Riley was released a few days after. She did experience a few side effects from the anesthesia but overall she pulled through like the fighter she is. While the hospital visits grew further apart after this surgery they certainly didn't stop by any means. A new problem arose with Riley about a month and a half after her portacath and g-tube surgery. She began to suffer from quite a few ear infections despite our best efforts to do everything we could to keep them dry. After about four back to back infections, a couple of which caused her to be hospitalized, we decided that, again, it was in Riley's best interest to move forward with yet another surgery. This time, Riley would have Ear Tubes placed inside her ear canals which would help drain the excess fluid the doctors were seeing. This surgery was scheduled to be an outpatient procedure but due to complications, we ended up having to stay at the hospital for another five nights. When Riley's doctor started the surgery he attempted to access her portacath so that he could draw blood and give her the medicine she needed. However, when attempting to do so, he realize that the port was clogged and was essentially rendered useless. He went forward with the surgery by successfully placing an IV line in her jugular vein as he was unable to get access from any other location. Later that night, Riley was put under yet again so that her portacath could be replaced. After this visit, we were able to stay out of the hospital till August of 2011. We got to enjoy some quality time together during these couple of months and did our best to live the life of a 'normal family', though I've come to learn that such a thing doesn't exist. Riley turned one in June of 2011 and had a blast doing so. She was able to stay healthy for a month prior to her birthday and began to hit some really big developmental milestones. She learned a few words, was really involved with her surroundings, and did her best to build her muscle tone. For her first birthday, our good family friend took it upon herself to bake a protein free Elmo birthday cake. Not only did it look like the real Elmo but surprisingly, even without protein, still tasted great. Riley loved it. It was her first taste of food that she appeared to actually enjoy. From May to August of 2011 Riley learned how to say "mama", "dada", "papa" (Grandpa), and "nana" (Grandma). Through her therapy classes and the help of her mom, she has also learned to sign "I want", "Eat", "Me" as well as a few other expressive gestures that the therapists say are good. She also learned how to walk around the room while holding on to objects. Oddly enough, this came before her ability to crawl. During these few months away from the hospital we truly got to enjoy each other and were able to share with Riley some of the lighter/happier things in life. She enjoyed a few trips to Disneyland, participated in play dates with her friends, experienced a preschool like atmosphere in her therapy classes, and so much more. Our hospital hiatus was short lived however as we found ourselves there again in August of 2011. In late August and in early September of 2011 Riley was hospitalized two times and began to suffer from random vomiting spells. She seemed to appear more lethargic, uncomfortable, and not the typical Riley we had seen for the past few months. We spoke with her doctors, called in a gastroenterologist to take a look at her intestines, and attempted changing her feeding schedule in an effort to help her with whatever she was going through. Unfortunately however, nobody had an answer. Right or wrong, we simply attributed it to the MMA and did all we could to help alleviate the symptoms. It was during this time that Katie joined a MMA support group and began asking more questions regarding what experimental treatments were being done on children with this disorder. Up until this point, we had been holding out hope for a drug in Europe which was in the testing phases that we were told could help with Riley's disorder, though it wasn't originally meant for this purpose. Unfortunately however, we found out that the testing phases had been cancelled. Disappointed, Katie reached out for advice from the support group she had joined and was pointed to Stanford University where they have been performing liver transplants on children with MMA. A commonly known fact in the 'MMA world' is that children who suffer from this disorder will eventually need a liver and/or kidney transplant. Common practice, until now, has been to wait until these children suffer from a catastrophic metabolic crash or complete organ failure. However, new research suggest that by performing these transplant surgeries early the children may experience a dramatic improvement in both the quality and longevity of life. After countless hours of research and talking with all of our doctors, we have decided that it is in Riley's best interest to move forward with the surgery. She has been placed on the National Organ Donors Transplant List and we're told that we can expect to move forward with a liver transplantation within 2 months. While speaking with the liver transplant team at Stanford and performing the required pre-operative testing the doctors found a duplication cyst which essentially is a benign growth in Riley's intestines. They believe it may be pushing against her stomach wall and preventing Riley's intestinal tract from functioning properly. What this means is that even if we decided not to go through with a liver transplant, Riley would still need surgery to remove this cyst. Riley will have this removed at the same time as she receives a new liver. Only time will tell what Riley's future will hold. Needless to say, this is the hardest thing we have ever been faced with. That said, we have no doubt that we can get through it. Katie and I have been a couple now for over 10 years (since we were 15) and have loved each other the whole way through. We will continue to love and support each other AND Riley as we all get through this difficult ordeal. Please keep praying. Please keep her in your thoughts and hope for the best. This will obviously take time to accept and embrace but I know we will as we get to know her and learn what she has to contribute to the family. The first day at the hospital the nurses were all saying how pretty she is and how she was the sweetest baby they've seen in a long time. I hope her calming and kind nature and natural beauty remain with her throughout her whole life. I have only known her for a short time and am already jealous of these traits. It also goes without saying that she is already one of the strongest people I know. She has endured so much in her short lifetime and has gone through it all with a huge smile on her face. I can only hope her persistence to live and thrive will only grow as she does.